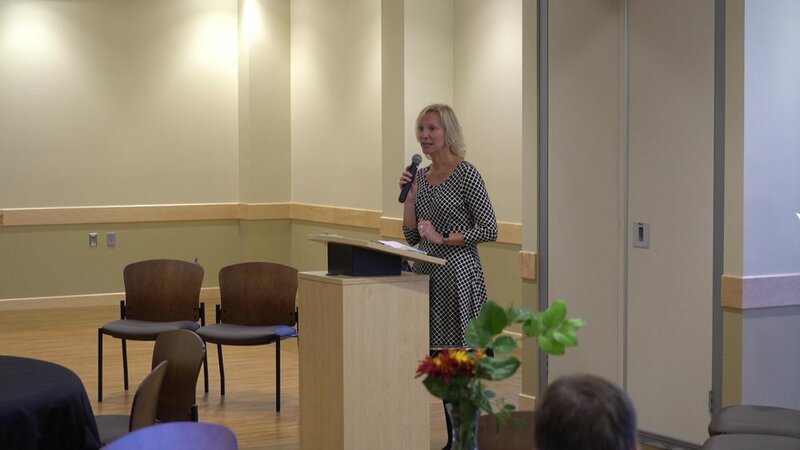 One of the newest resources for senior living in Rochester is the 125 Live Senior Center. 125 Live provides new opportunities for adults to make connections and to, as they say, “age successfully.” Whether that is through the fitness amenities, an art class, or playing billiards, this program is dedicated to providing a community through shared experiences. This state-of-the-art facility opened November 2016, and Midwest Hearing Loops was proud to be present at the opening ceremony and dedication. We were happy enough to be part of the construction process, as we installed 15 hearing loops in different rooms throughout the center. Among the looped rooms are two art studios, the fitness studio, the billiards room, and the River Room. We also installed counter loops for the person-to-person interactions that take place at the two reception desks. The River Room is one of the larger rooms that we looped on the premises, and one of the most well-used. It is a premiere gathering space and can be divided into four separate rooms. It is used for large presentations and can be rented by the public for wedding receptions, meetings, and events (such as dances). One regular use for that room is a weekly square-dance gathering. Another loop that we installed is in conference room 207. The room seats up to 16, and is where many meetings are held, including management and board meetings. This hearing loop system includes an advanced microphone system which picks up the conversation of all participants, so a person who relies on the loop can hear the entire dialogue and fully participate. We are excited to see how 125 Live moves forward with their exciting programming, and hope that more people will take advantage of the hearing loop technology to fully engage in what this center has to offer!